"The Congress shall have Power ... "To promote the Progress of Science and useful Arts, by securing for limited Times to Authors and Inventors the exclusive Right to their respective Writings and Discoveries." Definitions: Brevity: Either a complete article, story or essay of less than 2,500 words, (usually varies 3-8 pages depending on size of page and type) or an excerpt from any prose work of not more than 1,000 words or 10 percent of the work, whichever is greater. The TEACH Act facilitates and enables the performance and display of copyrighted materials for distance education. See how John Green (author of Fault in Our Stars, and many other books) combines sharing online with respecting copyright -- across three continents no less! Copyright Quiz Here’s a chance to find out how much you really know about the rules of copyright and the risks of Illegal copies. Taking the Mystery Out of Copyright Library of Congress's 4-part multimedia series on Copyright. Professor Eric Faden of Bucknell University created this humorous, yet informative, review of copyright principles. He is applying the fair use guidelines in the creation of this video for educational purposes. Creative Commons Attribution-Noncommercial-Share Alike 3.0 License (http://cyberlaw.stanford.edu/documentary-film-program/film/a-fair-y-use-tale). First determine if the use of the material is for criticism, comment, news reporting, education, scholarship or research. If the answer is no, apply for permission to use it. If the answer is yes, see if you can apply the following four factors. For what reason (educational/non-profit/commercial) will the work be used? Personal, non-profit, and educational (especially in a classroom setting) use weighs is favor of fair use, although that alone does not justify it. Is the work being used for parody, commentary, or criticism? Use of the work for a new purpose or in a new way weighs in favor of fair use. Is the work being used to create something new or add value to the work? If your use of a work is "transformative," you can more likely claim fair use than if you were to simply copy the work. Does the work contain facts (like a biography) or is it imaginative (like a novel)? Use of fact-based works is more likely to be considered fair than use of creative works. Is the work published or unpublished? Use of published works favors fair use; use of unpublished works does not favor fair use. What amount of the work do you want to use? There are no clear guidelines for what amount of a work constitutes fair use; it must be considered in relation to the whole. In general, the less used, the more likely you can claim fair use. Is the amount you want to use the "heart" of the work? Use of the defining or signature part of a work weighs against fair use. Are you using only what is absolutely necessary? The less used, the more likely you can claim fair use. Use of extraneous material weighs against fair use. Will your use of the work cause the copyright owner to lose income? If your use prevents people from purchasing the copyright holder's work, it is difficult to argue fair use. For instance, if this use replaces a coursepack that students otherwise would be required to purchase, you would have a difficult time claiming fair use. A work is considered transformative if it uses the original source of work in a completely new and unexpected way. Parody or any work that criticizes or comments on an original work may be considered transformative. Use in New Technologies, such as search engine companies making thumbprint size copies of images to put them into a searchable format. Other Transformative Uses, such as creating audio and video mixes and remixes. How is creativity being enabled by new technologies? What digital rights and responsibilities exist already, and what roles do we play as users of digital technology? Guidance for the use, without permission, of portions of lawfully acquired copyrighted works for student multimedia productions. Examples include text, motion media, illustrations, music, Internet, numerical data sets, copying and distribution limitations and more. Duke's Center for the Study of the Public Domain prepared this comic book to help students distinguish between copyright infringement and fair use. 3. the work is a work of the U.S. Government. 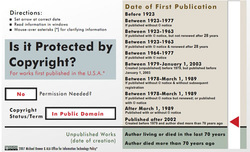 A work of authorship is in the “public domain” if it is no longer under copyright protection or if it failed to meet the requirements for copyright protection. Works in the public domain may be used freely without the permission of the former copyright owner. You will still need to cite your source if you use a public domain source in research or creation. Public Domain Review contains essays, books, images, film and audio. Creative Commons is a non-profit organization that offers licenses which allow creators to communicate which rights they reserve, and which rights they waive for the benefit of recipients or other creators. Federated search for CC images, video, and music hosted by other sites including Google.